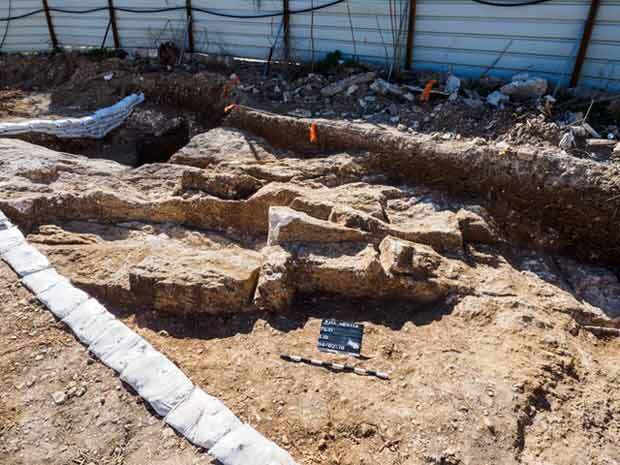 In February 2016, a salvage excavation was conducted at 22 Ha-Nevi‘im Street in Jerusalem (Permit No. A-7631; map ref. 221563–79/632385–423), prior to the construction. The excavation, undertaken on behalf of the Israel Antiquities Authority and financed by the contractor Mr. Ofer Licht, was directed by I. Zilberbod, with the assistance of N. Nehama (administration), Y. Billig (trial trenches), A. Hajian and M. Kunin (surveying and drafting), A. Peretz (photography), E. Belashov (plan), Y. Kupershmidt (metallurgical laboratory), D.T. Ariel (numismatics) and I. Lidsky-Reznikov (pottery drawing). A rock-hewn winepress, a quarry and a building (Figs. 1, 2) were exposed c. 20 m north of the Armenian monastery that was previously excavated at the site (Amit, Wolff and Gorzalczany 1995). Rock-hewn Winepress. 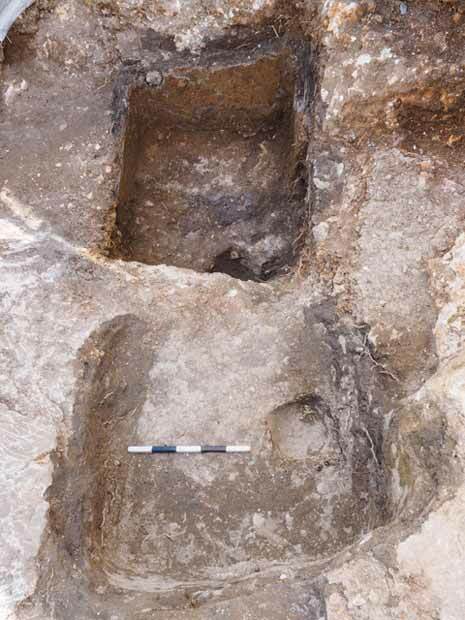 A small winepress was discovered in the southern part of the excavation area. It comprised two square vats treated with gray plaster (L14, L22; each c. 1.1 × 1.3 m; Fig. 3). 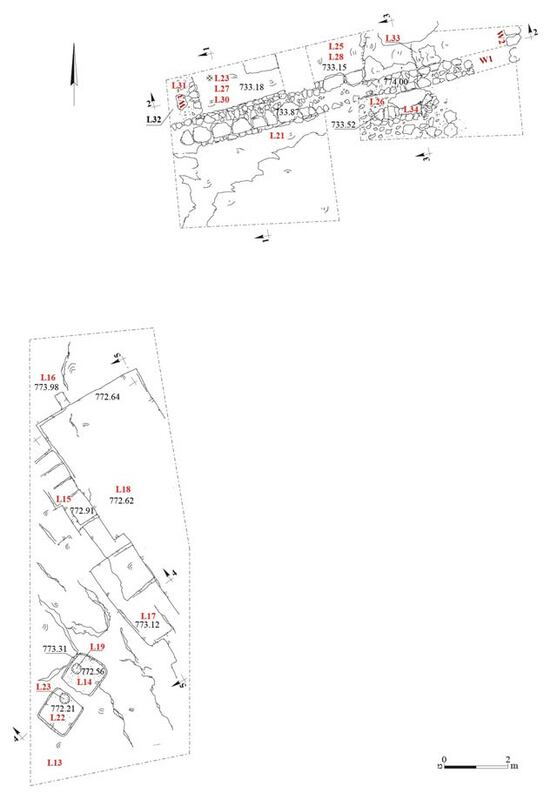 It seems that Vat 14 (depth 0.85 m) was a settling vat and Vat 22 (depth c. 0.5 m)—a collecting vat. Each vat has a circular sump (L19, L23; diam. 0.3, depth 0.25 m) in its floor. The upper part of the vats and the treading floor did not survive, as they were evidently destroyed when the quarry was in operation (below). No datable finds were discovered in the winepress. Quarry. Part of a quarry (c. 3.5 × 10.0 m; Fig. 4), comprising two quarrying steps (each 0.5–0.7 m deep), was exposed north of the winepress. 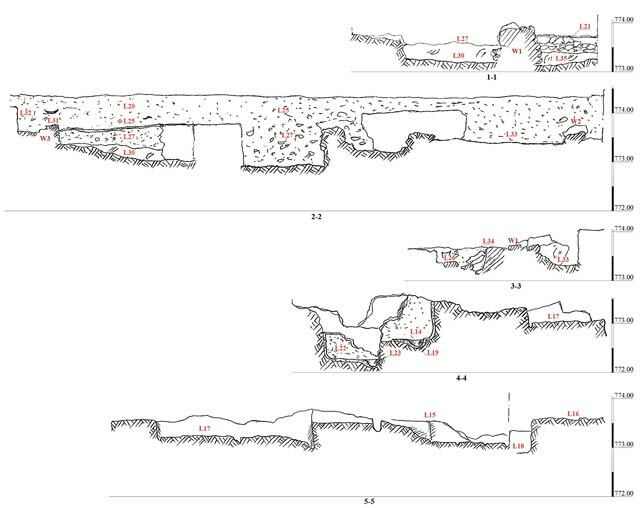 Evidence of quarrying stones (c. 0.5 × 0.5 × 1.0 m) that were produced in the quarry were noted on the upper step (L15), and severance channels (length 1 m, depth 0.2 m) were discovered on the lower step (L17). Fragments of a bowl (Fig. 5:1) and jug (Fig. 5:9) from the Byzantine period were found in the soil and quarrying debris (stone chips) that had accumulated on the quarry’s floor (L18). A nummis of Justinian I that was struck at the Carthage mint (527–537 CE; IAA 157295) was discovered on the upper quarrying terrace (L15). Building. 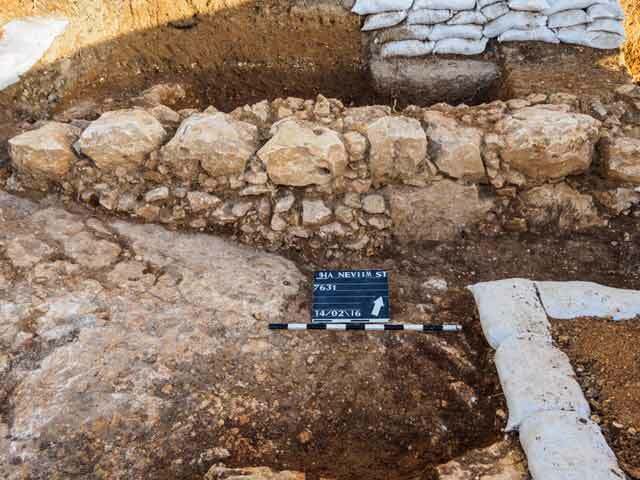 The southern part of a building was exposed at the northern edge of the excavation area (Fig. 6). Most of the structure was situated outside the limits of the excavation. 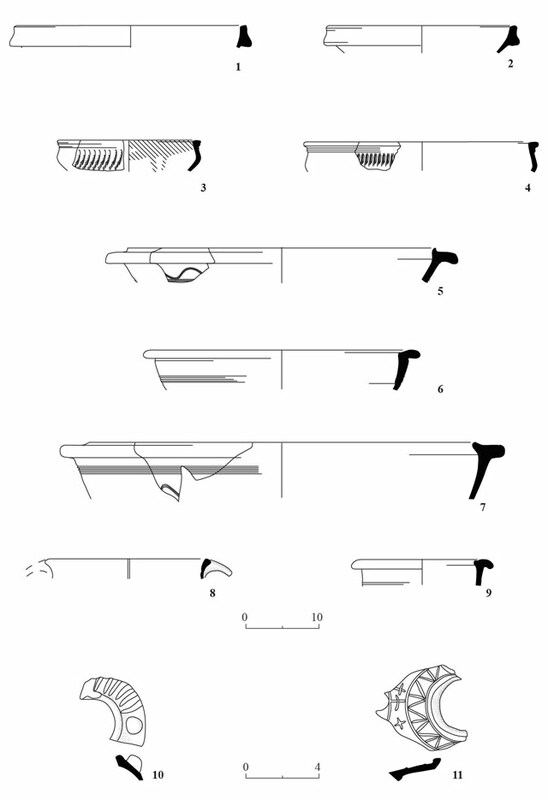 A wall (W1; length c. 10 m, width c. 1 m; Fig. 7) constructed of two rows of medium and large fieldstones and preserved to a maximum height of six courses (c. 0.8 m) was founded on the bedrock; the eastern end of the wall was not preserved. Wall 1 seems to have delimited the building from the south, since only its remains—a foundation trench, containing earth and stone fill (L21, L26; max. depth 0.5 m)—was exposed on that side of the structure. 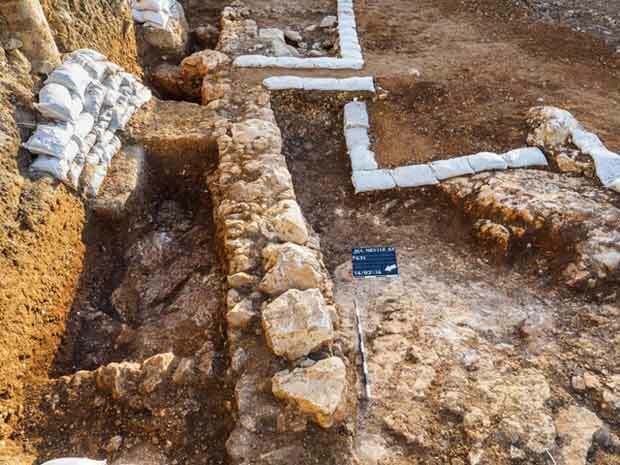 A row of three stones (W2; length c. 0.5 m) ran perpendicular to the eastern end of W1, possibly part of the building’s exterior eastern wall; most of wall was situated beyond the limits of the excavation. A third wall (W3; length c. 1.5 m, width c. 0.8 m, preserved height c. 0.4 m) adjoined the western part of W1 from the north. Collapsed stones (L31) were discovered above the wall. A small section of a crushed-limestone floor (L23; thickness c. 0.25 m) was found in the eastern corner formed by W1 and W3 was. It was laid on a layer of soil (L27), which covered a level of small stones (L30). Another section of a crushed-limestone floor (L32) was revealed in the western corner formed by these walls. Sixteen coins were discovered above Floor 23. Two of the coins were identified: a coin of Arcadius (383–395 CE; IAA 157298) and a nummus of Justinian I from the Carthage mint (538–542 CE; IAA 157299). Twenty-four additional coins were discovered in the layer of earth (L27) below Floor 23. Of these, only six were identified: a coin from 364–375 CE (IAA 157305), a coin from 425–455 CE (IAA 157303), a coin that is a cast imitation from 450–550 CE (IAA 157297), two coins dating from the fourth–fifth centuries CE (IAA 157301, 157304) and a worn drachma from the Persian period (IAA 157296). Eight coins were discovered in the soil and stone foundation (L33) of a floor that did not survive in the eastern part of the building. Of these, two were identified: a coin from 425–455 CE (IAA 157309) and one from the second half of the fifth century CE (IAA 157308). A cast coin dating from the mid-fifth century to the mid-sixth century CE (IAA 157306) and an Umayyad coin (post reform; IAA 157300) were found in Stone Collapse 31 and on Floor 23), respectively. Fragments of bowls and kraters (Fig. 2:5–7), a cooking pot (Fig. 5:8) and lamps (Fig. 5:10, 11) dating from the Byzantine period were discovered above and below Floor 23. Ceramic finds from the Byzantine period were discovered in the quarry and in the building. All the coins found in the excavation, except for two, date from the mid-fourth century until the mid-sixth century CE. The ceramic finds and the coins date the building and the quarry to the Byzantine period. It seems that stones used in the construction of the adjacent building were produced in the quarry. Although no artifacts were discovered in the winepress, which could have helped in dating it, the winepress does predate the quarry, as its operation damages the installation. Amit D., Wolff S. and Gorzalczany A. 1995. Jerusalem, the Third Wall (Area D). ESI 13:80–83. 3. The two vats in the winepress, looking southwest. 4. The quarry, looking southwest. 6. The building, looking northeast. 7. Wall 1, looking north.